Product information "Neff B57CR22N0B Built-In Single Oven"
The Neff B57CR22NOB is another built in single oven with Neff's popular Slide&Hide oven door and pyrolitic cleaning. The Slide&Hide door fully retracts inside the oven when it is open allowing full unrestricted access to the oven interior. The clever oven door handle rotates from the front of the door to the top of the door as you open it making it a very flowing smooth action for both opening and closing. The Neff B57CR22NOB comes with a labour saving pyrolitic self clean funtion. You simply close the oven door (leaving the shelf and grill pan in too if they require cleaning). The door will lock then the oven will heat to a very high temperature taking between 1 hour 15 minutes to 2 hours dependent on how soiled the oven is. And food deposits wil be burned to a fine ash which can be wiped out with a damp cloth once the cycle has completed. The Neff B57CR22NOB uses Neff's CircoTherm hot-air cooking system for simultaneous baking and roasting on all three levels producing perfet results every time. 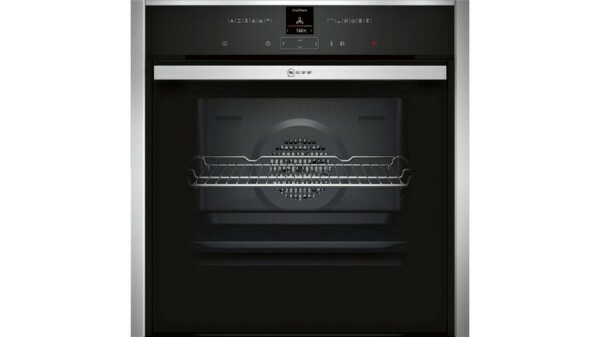 This oven has a fully digital diplay and touch controls for easy operation and a clean modern finish. Oven functions are clearly displayed on the control panel with a touch button for each. The Shift Control is used to easily navigate through lines on the dislay and alter settings therein. There are a variety of different cooking programmes including bread baking, a pizza setting, dough proving and Neff's outsatnding CircoTherm hot air function. The Neff B57CR22NOB is stylish, well finished appliances filled with innovative features and sensible technology to make for a very versatile appliance that is energy efficient, simple to use and will look great in your kitchen. Pyrolytic following heavy use - just let the oven interior clean itself. EasyClean® - the quick and easy option for day to day maintenance. Related links to "Neff B57CR22N0B Built-In Single Oven"
Customer evaluation for "Neff B57CR22N0B Built-In Single Oven"